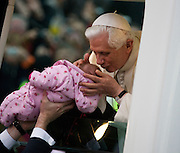 Pope Benedict XVI's papal tour of Britain 2010 was the first visit by a pontiff since the Polish John-Paul pastoral tour 1982 - but this time, the Pontiff was granted the status of a full State Visit, usually offered to Heads of State. Taxpayers therefore footed the £10m bill for non-religious elements, which largely angered a nation still reeling from the financial crisis. Pope Benedict XVI is the head of the biggest Christian denomination in the world, some one billion Roman Catholics, or one in six people. In Britain there are six million Catholics but only a quarter of whom regularly attend Sunday Mass and some churches have closed owing to spending cuts.